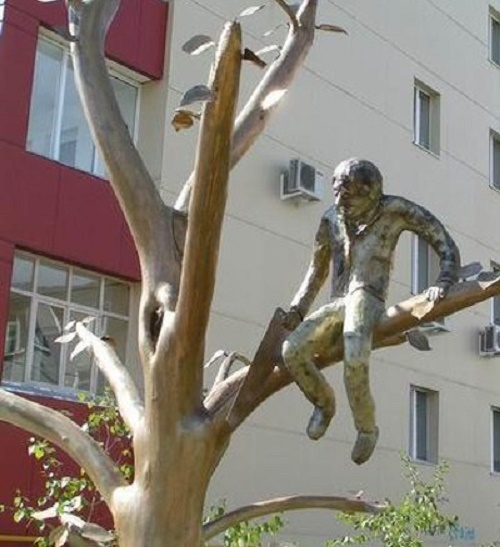 Installed in the northern Russian city monument, is in fact, the illustration of the popular wisdom “Do not cut the branch on which you sit”. And thus, one of the craziest ideas of sculptors embodied in the old Russian proverb. The monument decorates one of the main streets in Yakutsk, Republic of Sakha. The monument is a graceful tree that stretched out its branches in different directions. On one of the knots – an unknown man with a sad face. With a hacksaw in his hands, despite the well-known ending, a bronze hero is diligently doing his job. Funny monument attracts many tourists and collectors of unusual places. To the monument literally flood the guests of the city, thanks to its strategic location. Almost everyone tries to climb up next to the frozen figure and capture an outstanding moment. Although the city administration does not approve such actions, to drive away all comers is not always possible. Anyway, the plate next to the monument reminds politely not to touch the work of art. When people say the proverb, they use the word “cut”. Meanwhile, the proverb says not about an axe, but about a hacksaw. Thus, the figure saws the branch and the proverb should be “Do not saw the branch on which you sit”. Interestingly, a similar monument depicting a man with a hacksaw sawing a trunk of a huge tree, on which he sits is in Europe. 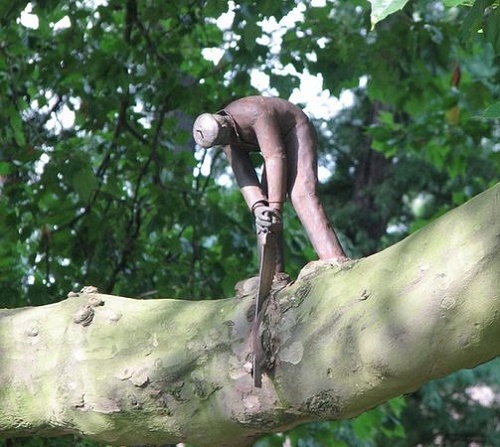 The sculpture looks organically on a branch of a large tree in one of the yards of Amsterdam. So, the wise proverb “Do not cut the branch on which you sit,” is, perhaps, international. A discreet sculpture by an unknown author appeared in this place in 1989. In this regard, we can recall the hacksaw monuments. 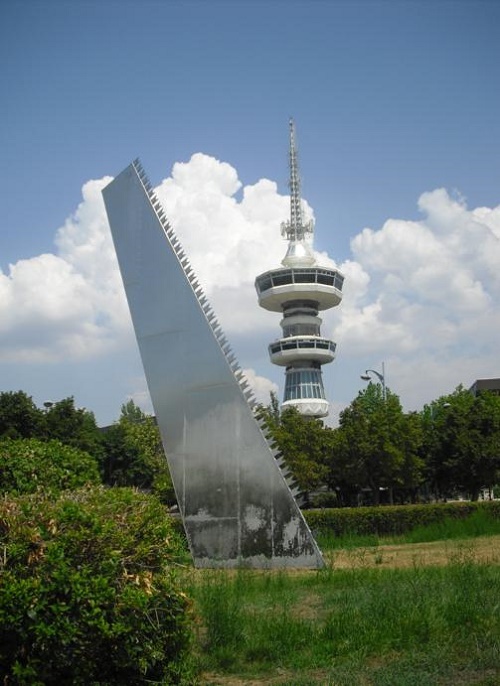 The most interesting of them is in the Japanese city of Tokyo, and in Thessaloniki, Greece. And one more, related to the monument to a man cutting the branch, is, perhaps, the Monument “The biggest ax in the world” in the Canadian city of Woodstock. Built in 1991 as a symbol of the importance of the forest industry in the province of New Brunswick, it is on the outskirts of the city, in the forest area. The ax is set to a low circular pedestal diameter of 10 meters, in which laid the time capsule. 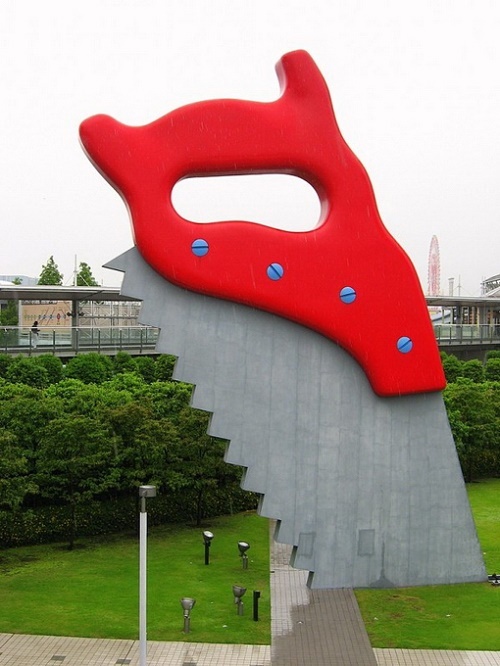 The engraving reads “The World’s Largest Axe. 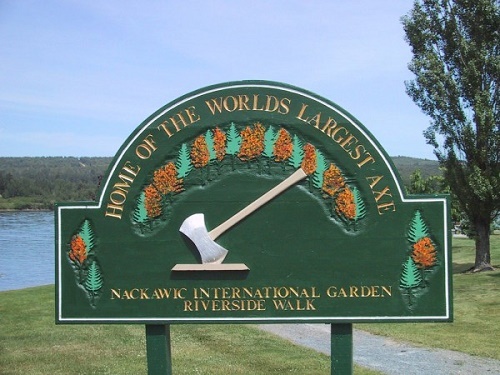 This giant axe symbolizes the importance of the forest industry, past, present and future, to the Town of Nackawic and the Province of New Brunswick. 1991.” This sculpture reminds us of the importance of the forest industry in the past, present and future. 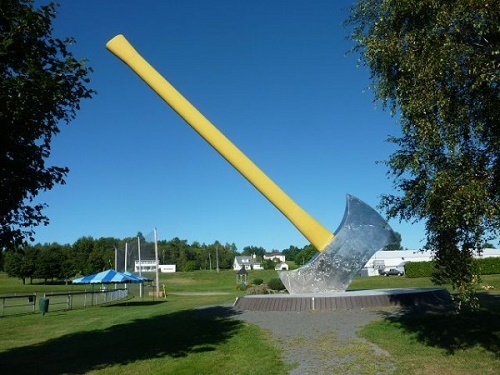 The Woodstock company, which has developed and made the ax monument, did their best – the height of the biggest ax in the world of 15 meters and weight of more than 55 tons! The width of the “head” of 7 meters and 10 m diameter pedestal.